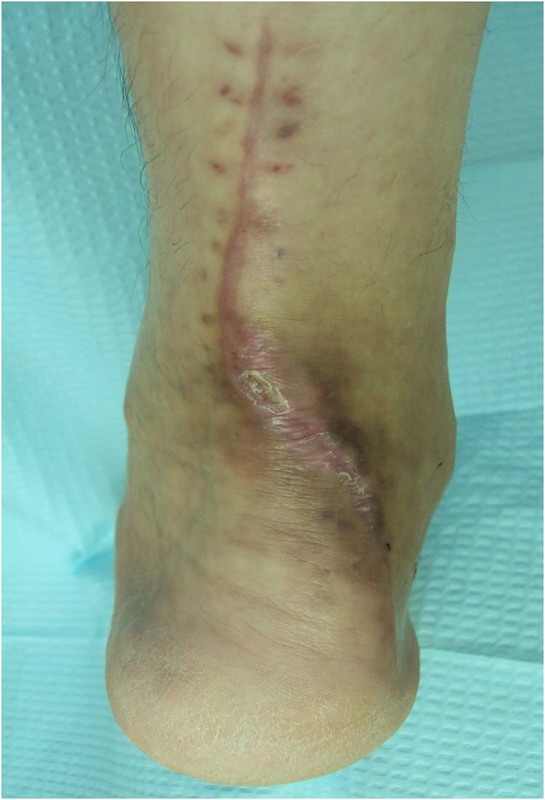 The clinical presentation of a diabetic patient with an open infected lesion and concomitant chronic tophaceous gout of the Achilles tendon is evaluated and treatment is described. 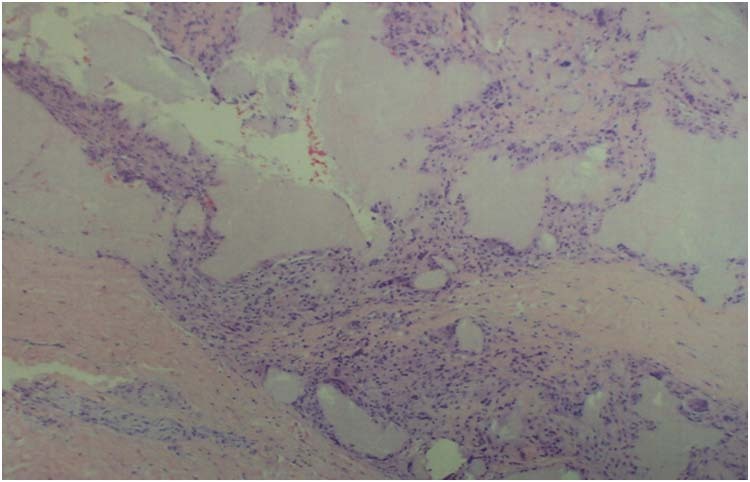 The 42-year-old man suffered from chronic tophaceous gout with multilobular, solid, tender, enlarged subcutaneous nodules affecting the right hand and both feet. The patient was neuropathic and wearing tight shoes which resulted in laceration of the posterior skin near the soft tissue mass. This resulted in an infected ulcer and cellulitis. He was treated by incision and drainage with removal of the tophaceous mass from the Achilles tendon, sural nerve decompression, as well as debridement of the Achilles tendon. 1Chief Ilizarov Surgical Instructor at Doctors Hospital West Covina, California. 2,3,4,5Residency, Doctors Hospital of West Covina, California. (PM&S 36). 6Greater Chicago Rheumatology, Chicago, Illinois. 7Pathologist, St Alexius Medical Center, Hoffman Estates, Illinois. Gout is a condition characterized by deposition of monosodium urate crystals in tissues. Acute gout is preceded by elevated serum uric acid levels, although hyperuricemia is often not present during a gouty attack. It is also important to note that most patients with hyperuricemia never experience a gout flare. As crystal deposition favors areas of the body with lower temperatures, and therefore further from the heart, it has a high tendency to affect the foot, particularly the first metatarsal-phalangeal joint, in about 56-78% of patients. This is known as podagra. An acute gout flare is often characterized by a red, hot, and swollen joint that is very painful to touch, representing a similar clinical presentation as cellulitis. Figure 1 Infected right posterior ankle and lower leg area. Definitive diagnosis of acute gout is made by observation of negatively birefringent crystals in fluid aspirated from the affected joint. Joint aspirate analysis has been shown to have sensitivity of 85 percent and specificity of 100 percent. 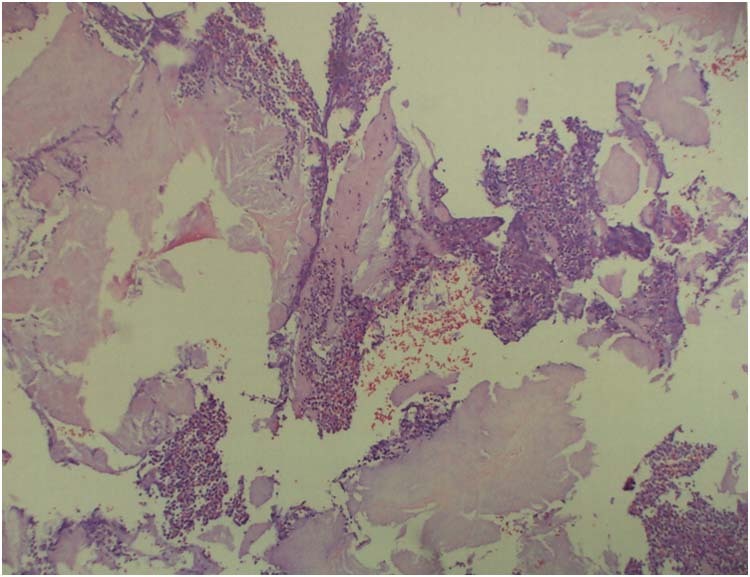 [2,13] In the absence of joint aspirate analysis, clinical diagnosis may be made based on meeting certain criteria which include podagra, hyperuricemia, history of monoarticular arthritis followed by asymptomatic periods, palpable tophi and knowledge of certain known co-morbidities associated with gout. Gout is a multifactorial condition, and as such, must be treated in a multifactorial manner. Gout is caused by altered purine metabolism, but other factors, including high purine diet, alcohol intake, and reduced renal clearance may also contribute. Therefore, lifestyle modification must be a part of any treatment regimen. Acute gout attacks usually resolve without treatment within days to weeks. However, treatment can decrease the duration of an attack and decrease frequency of future attacks. NSAIDs (i.e. indomethacin), corticosteroids (i.e. Prednisone) and colchicine are first-line therapies in cases of acute gout. Colchicine is less commonly used due to the potential side effects. Uric acid lowering agents are often used to treat chronic hyperuricemia. 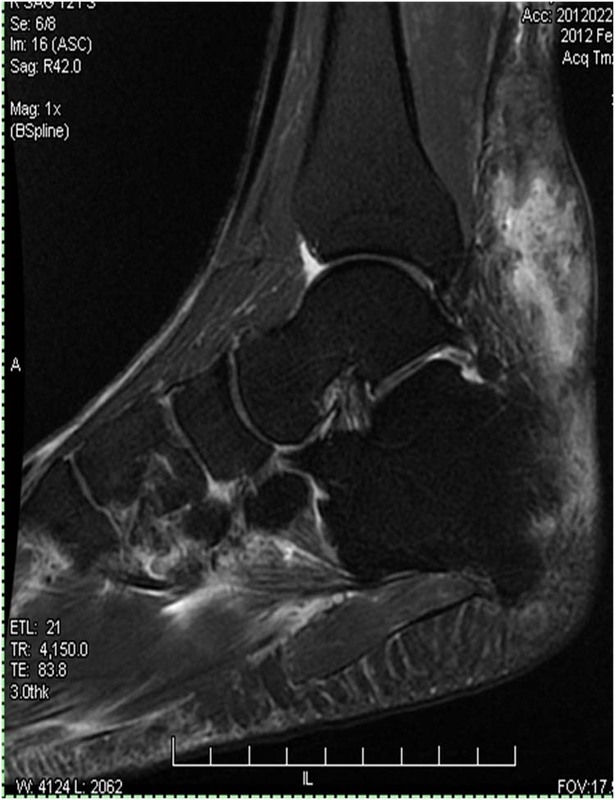 Figure 2 Magnetic resonance image (MRI) of the right lower extremity shows a large mass engulfing the Achilles Tendon. These agents are not started during an acute gouty attack, as they can exacerbate the symptoms. These include allopurinol, which is the most commonly prescribed, as well as probenecid and febuxistat (Uloric®, Takeda Pharmaceuticals U.S.A., Inc). The primary treatment for tophaceous gout is to lower the uric acid level with dietary and medical therapy but this may not be easy to achieve therefore, surgical treatment maybe indicated. Surgical intervention has been shown to have a high incidence of complications6, therefore it is mainly recommended when tophi cause pain, skin necrosis, ulcerations, sinuses, nerve compression, interference with tendon function, or when joints are being destroyed and painful. It is important to distinguish gout from other conditions, as symptoms of acute gout may mimic those of other conditions, and vice versa. Septic arthritis may display the involvement of a single joint, with leukocytosis and elevated erythrocyte sedimentation rate (ESR). Septic arthritis and acute gout may even occur simultaneously. 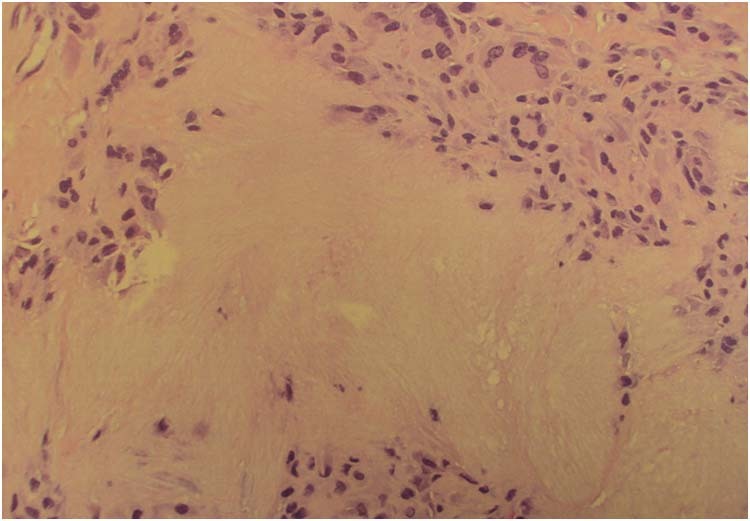 This report describes a case of lower extremity infection in the presence of gouty tophi in a diabetic neuropathic patient with infiltration into the sural nerve. Figure 4 Left posterior ankle without any infection. On the right hand (Fig 3) as well as the left posterior ankle (Fig 4), there were indurated soft tissue masses for which the patient denied any pain. He had a large non-infected tophi on the left lower extremity. The patient was placed in a prone position under general anesthesia with a thigh tourniquet. A curvilinear incision was made from the middle of the leg on the medial side, going inferiorly across the open wound and ulcer and then crossing over onto the inferior lateral heel area. The incision was deepened down to the subcutaneous tissue and then down to the deep tissue. There was a tremendous amount of brown pus draining from the wound area. Culture and sensitivity for gram positive, gram negative, anaerobic and aerobic organisms were performed. 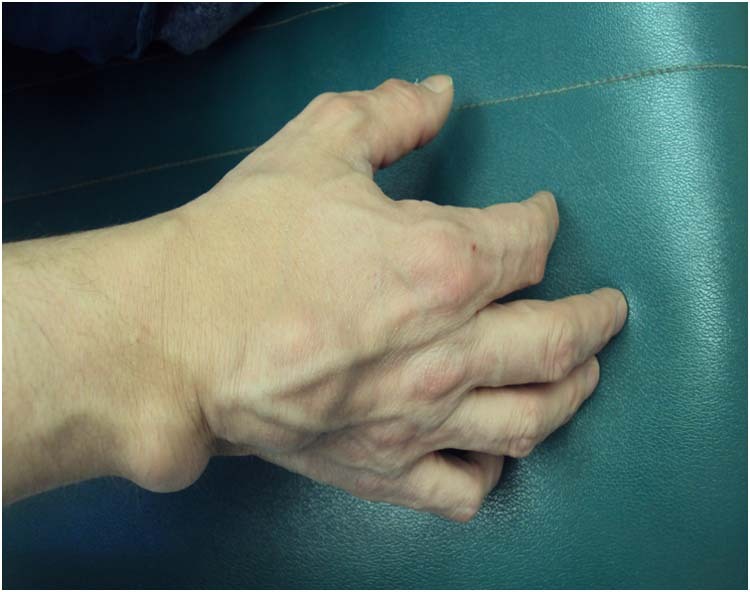 There was a large amount of adhesions noted at the subcutaneous and deep tissue. There was also a large soft tissue mass engulfing the Achilles tendon and sural nerve (Fig. 5 and Fig. 6). Neuroplasty of the sural nerve with surgical loupes was performed. 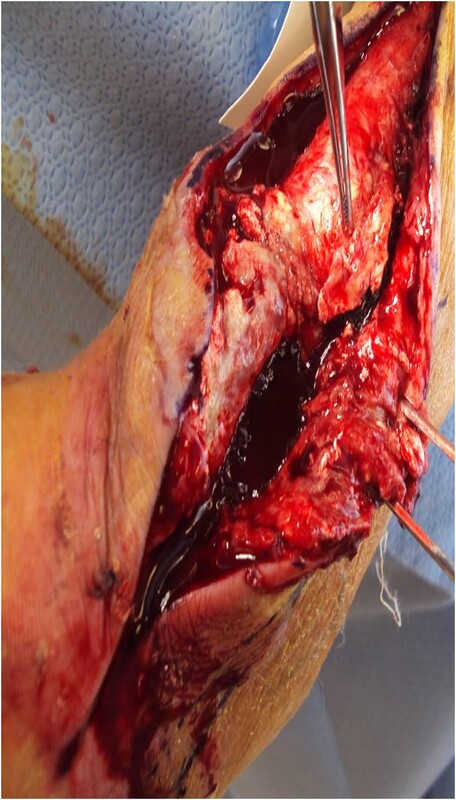 Figure 5 Infiltration of the soft tissue mass engulfing the Achilles tendon. 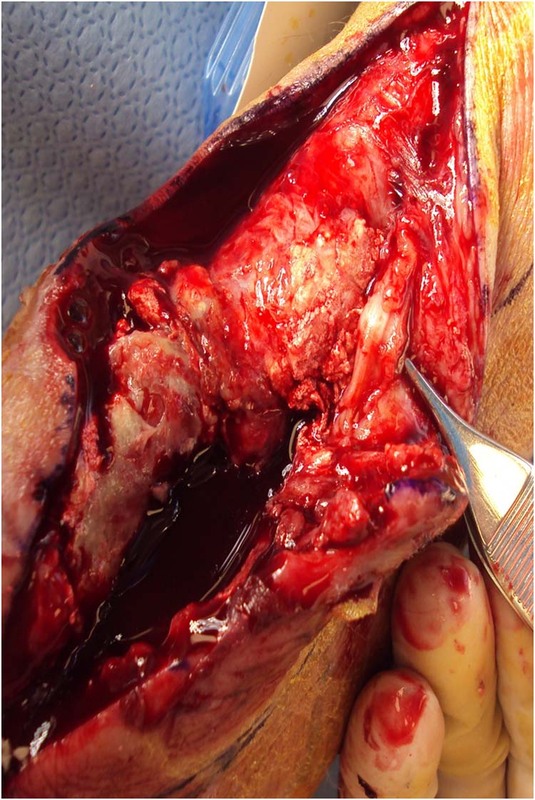 The entire mass from the posterior, medial, lateral and anterior aspect of the Achilles tendon was removed. 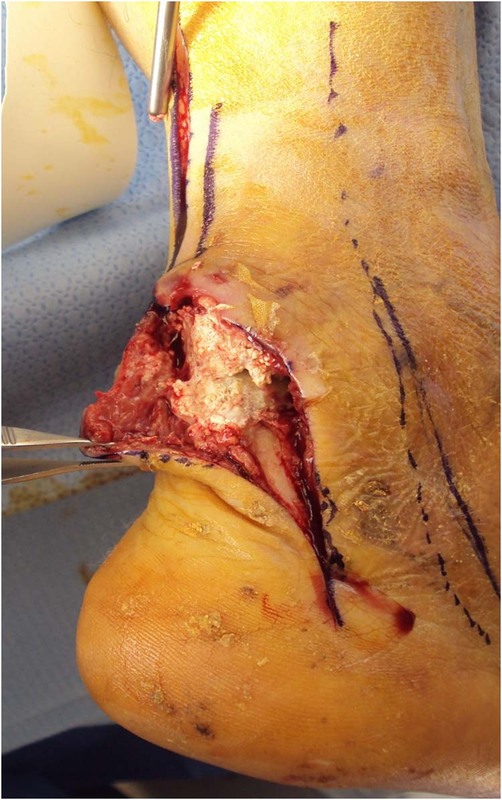 The Achilles tendon was also debrided of any degenerative tissue (Fig. 7 and Fig. 8). The necrotic skin was debrided and the skin edges were approximated using 3-0 ProleneTM, Ethicon Inc in simple as well as horizontal mattresses. The open wound area was loosely approximated and packed with Iodoform gauze. The surgical site was dressed with XeroformTM, Covidien, gauze, and KerlixTM, Covidien. Gout, a common metabolic disorder has increased in prevalence worldwide and is estimated to have doubled in the US alone within the last three decades. Though gouty tophi are typically found in joints, it may also be present in tendons and soft tissue such as Achilles tendon, ear helices, sclera, and sub conjunctivae. Despite many studies which report that gout may be found in these places, there are currently little to no studies reporting the epidemiology of gout present in places like the soft tissue or rearfoot. Figure 6 Sural nerve entrapment (forceps) with the soft tissue mass. 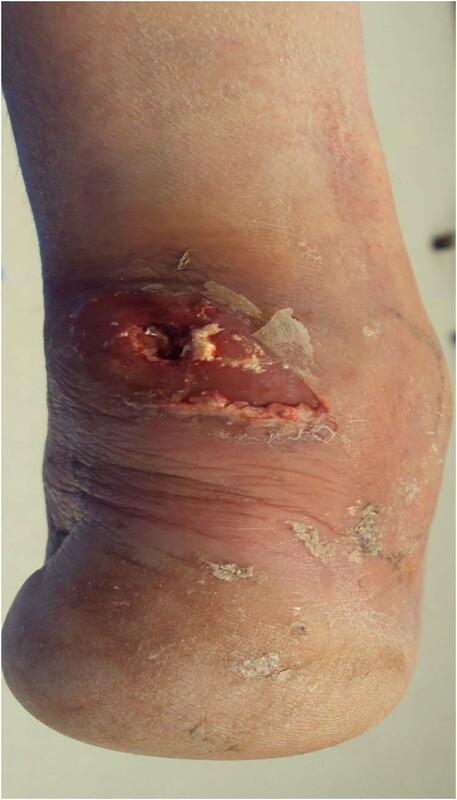 In this case study, we reported on an infected tophaceous wound. (Fig 7) Histology of the mass is shown in Fig 9-12. Culture and sensitivity revealed infiltration by Streptococcus agalactiae, also known as Group B streptococcus or GBS, which is a beta-hemolytic Gram-positive streptococcus. Though rare, it is important to note that tophi, when left untreated for a long duration, may accumulate and can lead to ulceration which can become infected. A 2011 case study reported a patient who was noncompliant with his allopurinol regimen, and resulted in a tophaceous ulcerated nodule overlying the dorsal first and second metatarsophalangeal joint of the left foot. Figure 7 Removal of the soft tissue mass. 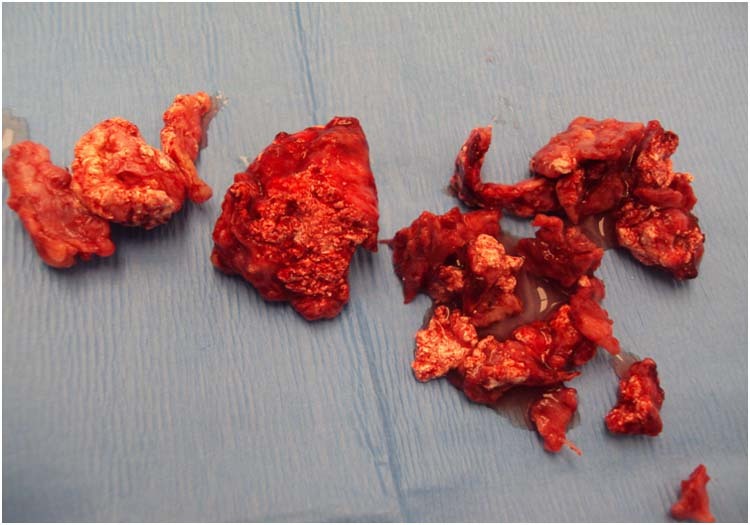 Gross description: 17.2 gm of dark brown to pale yellow soft tissue mass. Sectioning reveals cystic mass with chalky white substance. It is important to monitor gout, especially in manifestations at the Achilles tendon because if left untreated it may exhibit traumatic effects. Though not as common as in the joints, tophi have been known to be found in the Achilles tendon. A 1981 case study of an acute Achilles rupture alluded to the rupture possibly being caused by gout with deposits consistent with tophi found throughout the tendon, especially at the rupture site. Often times when assessing the aspirate of a red, hot, swollen joint, if synovial crystals are found a diagnosis of a crystal arthritis such as gout or CPPD is automatically assumed. However, a retrospective study based at a US urban medical center looked at records of all the joint synovial crystal aspirates from a seven year span, containing a total of 265 synovial crystal joint aspirates. 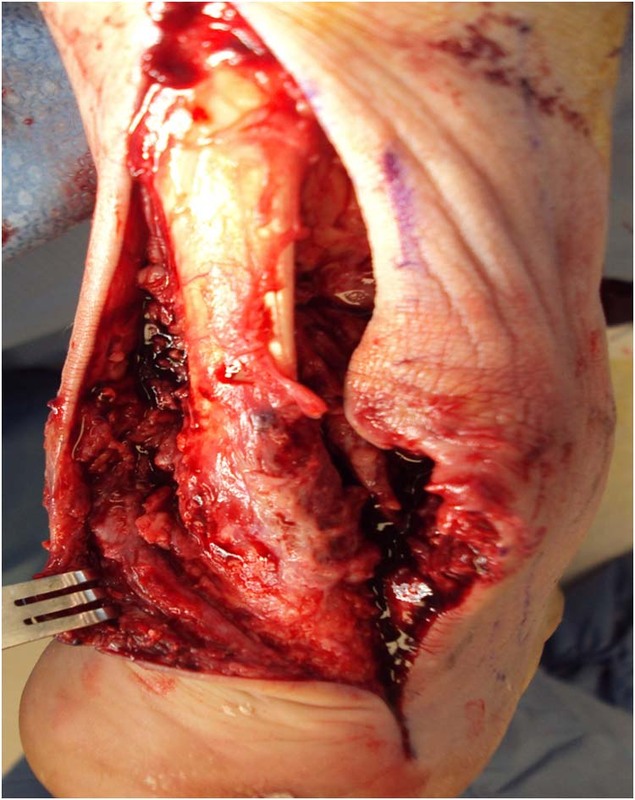 Figure 8 Surgical appearance after removal of the mass from the Achilles tendon as well as debridement of the Achilles tendon. Of those 265 aspirates, 4, or 1.5%, came back positive for bacterial cultures confirming concomitant septic arthritis with crystal arthritis. While this may seem a small amount, if left untreated may have deleterious effects on the patient. Another study of 30 cases of concomitant septic and gouty arthritis in 2003 from Taiwan stated that wounds as the result of subcutaneous tophi rupture were the most common source of concomitant septic and gouty arthritis, with the most common infectious organism being Staphylococcus aureus. Fourteen went on to receive surgical debridement with 9 having no reported complications. Figure 9 Low power of chronic gouty inflammatory reaction with foreign body giant cell proliferation. 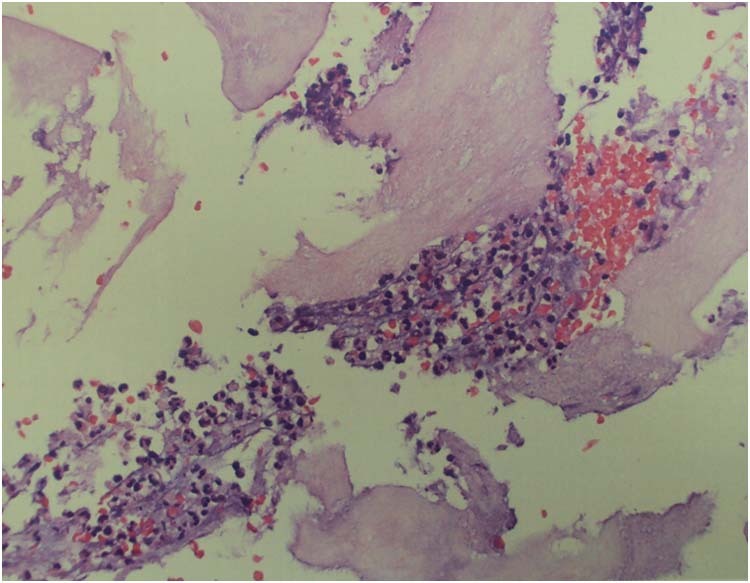 Figure 10 Formalin Fixation has destroyed the uric acid crystals to leave amorphous eosinophilic material. Note the multinucleated giant cells indicating chronic inflammatory process (upper right). With the degeneration in Western diet consisting of increased intake of fast food, soft drinks, and meat it is no surprise that gout and diabetes are common co morbidities. A 2008 study based at the University of Pennsylvania Medical Centre expanded on the notion that hyperuricemia, gout, and metabolic syndrome are associated with each other. This suggests that gout in men with a high cardiovascular risk profile is at a higher risk of developing type 2 diabetes. Figure 11 Low power of acute gouty inflammation showing gouty casts. Figure 12 Note the inflammatory neutrophils. When dealing with diabetic patients, wounds and resulting infection can lead to limb loss or even death. Therefore it is pertinent to monitor both gout and diabetes, because gout left untreated could be a means for ulceration. Figure 13 Several months after surgery shows complete healing with good Achilles tendon strength. The case study presented in this article highlighted the significance of the necessity of a thorough examination for patients with numerous risk factors. While our outcome was positive (Fig 13), without a thorough debridement and attentive follow up, this case had the potential to result in a below the knee amputation. This is especially true with the known potentially poor healing capacity of diabetics. Moreover, it vital that in order to prevent recurrence patients with gout must be tightly controlled. As discussed before, infected gouty tophus of the Achilles tendon is a rare finding even though gout commonly affects the foot and ankle. A thorough history and physical examination with assistance of advanced diagnostic tools and laboratory studies is essential to properly diagnose this condition. Differential diagnosis of gout should always be considered in patients with a history of hyperuricemia even if symptoms are masked by cardinal signs of infection. Medical and surgical therapy has been reported to successfully treat this condition. Our case report demonstrates good prognosis with early recognition and successful surgical debridement. 1. Becker M. Clinical manifestations and diagnosis of gout. In: UpToDate. Basow DS (Ed), Waltham, MA, 2012. 15. Zhang W. EULAR evidence based recommendations for gout. Part I: Diagnosis. Report of a task force of the standing committee for international clinical ctudies including Therapeutics (ESCISIT). Annals Rheumatic Dis (2006) 65: 1301-311.